Gallium is a chemical element with atomic number 31 and element symbol Ga. It is considered to be a post-transition metal or basic metal. Gallium is known for its low melting point, which lends itself to the gallium spoon demonstration and even melting the pure metal in your hand. Here is a collection of gallium facts, including the discovery, properties, uses, and sources of the element. 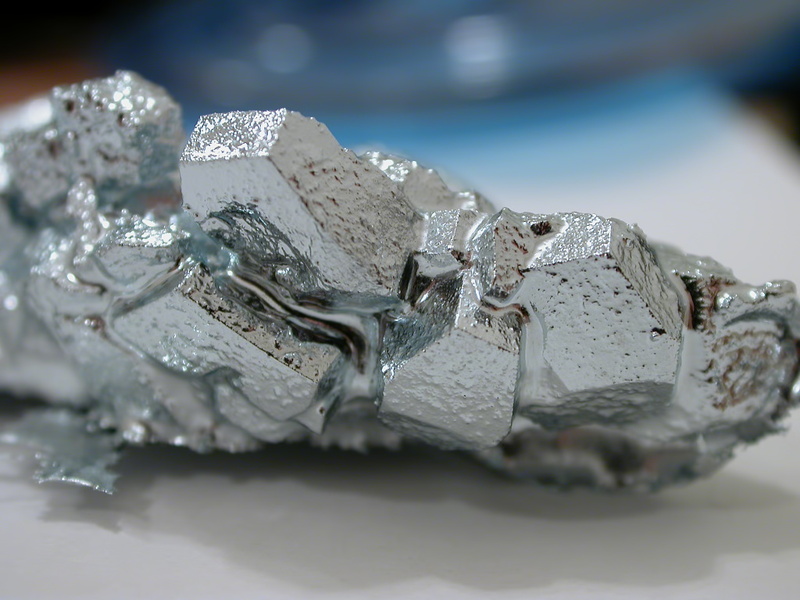 Appearance: At room temperature, gallium is a soft, silvery-blue solid metal. Discovery: Lecoq de Boisbaudran discovered and isolated gallium in 1875. However, Dmitri Mendeleev predicted the element’s existence in 1871. Mendeleev named the proposed element “eka-aluminium” from its position on the periodic table. Lecoq de Boisbaudran identified gallium from two violet spectral lines in a sphalerite sample. He isolated the element using electrolysis of the hydroxide. Word Origin: de Boisbaudran named element 31 “gallia” to honor his native land, France. Gallia is the Latin name for Gaul. Some also say de Boisbaudran’s name was a play on words, naming the element for himself as well as France. “Le coq” is the French word for “the rooster,” while the Latin word for “rooster is “gallus.” The element was later named gallium in keeping with the -ium suffix for metallic elements. Isotopes: The 31 known gallium isotopes range from mass number 56 to 86. 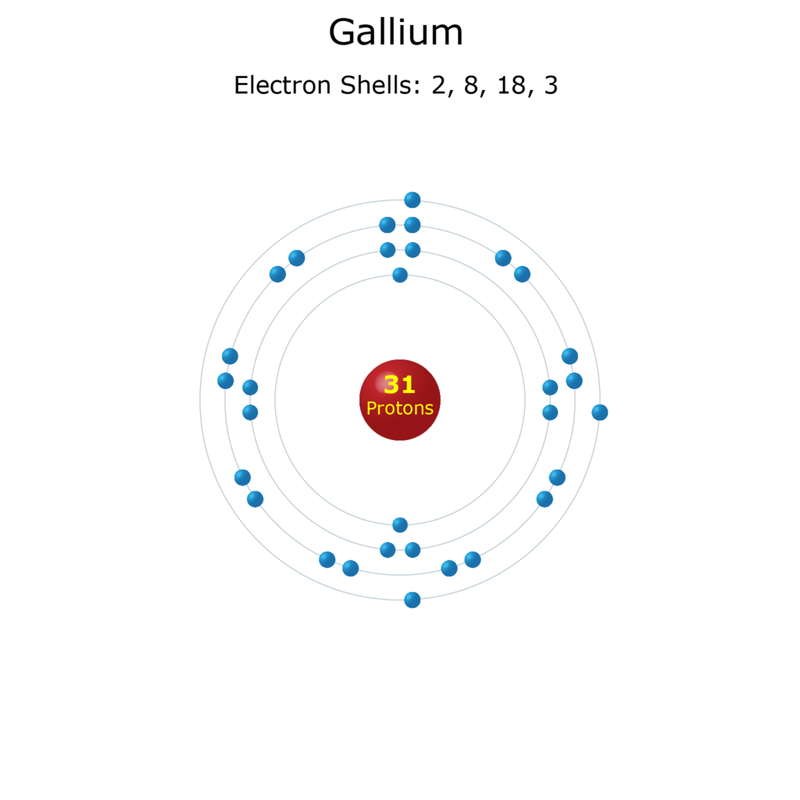 Two isotopes are stable and occur in nature: gallium-69 and gallium-71. Gallium-69 accounts for 60.1% of the natural abundance, while gallium-71 accounts for 39.9%. All of the other isotopes are radioactive. Uses: Gallium is used to make thermometers, particularly replacing toxic mercury. Gallium is important to produce solid state devices and dope semiconductors. Gallium arsenide converts electricity into coherent light. The metal forms a brilliant mirror coating. Biological Role: Gallium serves no role in human, animal, or plant biology. The pure metal is considered non-toxic. However, gallium replaces iron(III) in the body. In bacteria, such as Pseudomonas, uptake of gallium can interfere with respiration and lead to cell death. In human medicine, gallium is used to track inflammation and mark tumors. The element has anticancer properties, particularly against non-Hodgkin’s lymphoma and urothelial cancer. An amine-phenol gallium compound is toxic to malarial parasites, including those resistant to chloroquine. Sources: The main commercial source of gallium is bauxite ore. Gallium production is a by-product of aluminum processing. Smaller quantities of gallium are extracted from sphalerite, other zinc sulfide ores, and some types of coal. Isolating gallium occurs by electrolysis of its hydroxide in potassium hydroxide solution. 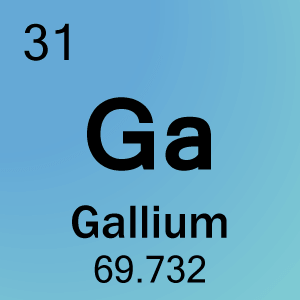 Gallium is the element with atomic number 31 and element symbol Ga.
Elemental gallium does not occur free in nature. However, smelting readily releases the metal. You can melt gallium in the palm of your hand or make a spoon of it that will melt in a hot drink. Of all the elements, gallium has the highest temperature range as a liquid. There are 2373 °C between gallium’s melting point and boiling point! Unlike most substances, gallium expands when it freezes. Another material that displays this behavior is water. Gallium shouldn’t be stored in glass or metal containers because they could shatter when the element solidifies. Gallium arsenide is used to produce extremely bright blue LEDs. Liquid gallium forms an exceptional mirror because the element wets many surfaces. Gallium wets glass, porcelein, and even human skin. The “gallium beating heart” is a safe substitute for the “mercury beating heart” chemistry demonstration. Over 95% of gallium is used in the semiconductor industry. Pure gallium resists attack by mineral acids. The oxide layer that forms on the surface protects the interior. When added to other metals, gallium forms low-melting alloys. Lehto, R. S. (1968). “Zinc”. In Clifford A. Hampel. The Encyclopedia of the Chemical Elements. New York: Reinhold Book Corporation. pp. 822–830. ISBN 0-442-15598-0. Lide, David R., ed. (2006) Handbook of Chemistry and Physics (87th ed.). Boca Raton, Florida: CRC Press, Taylor & Francis Group. ISBN 0-8493-0487-3. Nordberg, Gunnar F.; Fowler, Bruce A.; Nordberg, Monica (2014). Handbook on the Toxicology of Metals (4th ed.). Academic Press. pp. 788–90. ISBN 978-0-12-397339-9.